Velobici: White must play , guaranting that White will be able to create a Bulky Five by playing at either a or b. Where White to play anywhere else, Black would play at the location of creating two eyes and living immediately. The proverb states that five liberties in a big eye are the equivalent of eight liberties. White has only seven outside liberties. 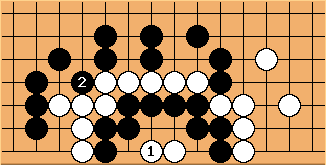 Playing it out: After , White fills Black's big eye, while Black fills White's outside liberties. 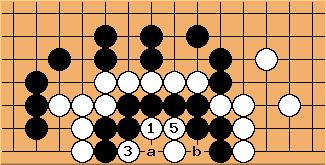 With at either a or b, the bulky five appears within Black's group. 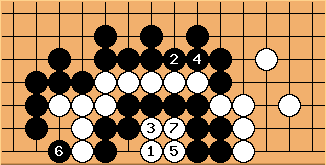 Black captures the five White stones by playing within the Black group. Xanthus: What about this one? Velobici: The ko appears to be worth about 44 points. (original 11 White stones and 10 Black ones). Hard to find threats that big. Not impossible though. In addition, Black gets two moves elsewhere to remove aji in preparation to fight the ko. Black allows White to create the ko by playing followed (alternatively, could be at b). Now, Black is in atari, so Black captures the ko by playing a. White can not play b...its suicide. White must make a ko threat. Black ignores White's ko threat and plays b capturing the inside White stones and making life. George Caplan The diagonal move is the best for White. 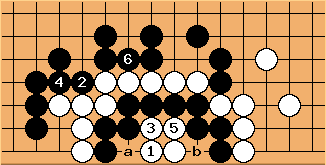 The ko is forced, Black cannot avoid it by playing at "3" in the final diagram - now White can win the capturing race outright. There are often many ko threats of this size, and White will not need many. unkx80: I would think that the order of and should be swapped, no? Velobici: Not clear to me the practical difference of playing then . Either way Black gets to tenuki a second time and either way Black will capture the ko first. Is it true that "There are often many ko threats of this size" (44 points) ? If so, then what size ko is uncommon ? 60 points ? 100 points ? Not going to hold anyone to a firm number. 44 points seems very large to me. Trying to understand. George Caplan Many ordinary early endgame moves have values approaching 20 pts, and here we are talking about two moves in a row. It depends on the game of course, but look at a common joseki, like a one space low pincer of a keima approach to a 4-4 point. When the approaching player takes the corner, it is very common for the pincer player to cut the approach off, the other guy lives in the corner, jumping into the other side. The ko threat of pushing down is huge, killing a 10 pt plus corner, killing 4 stones outright and having huge strategic consequences. The absolute value is easily 30, with the impact on the whole board, it exceeds 40. And the threatening player gets three threats for this alone. ChrisSchack: B could tenuki the above ... but B could also capture, and the ko fight is on. W will have to ignore a threat to play above, then ignore another to capture. Filling the ko isn't good enough, then you're into filling the whole eyespace again and it's just not fast enough. Bill: This position has several interesting features. First, it is hyperactive: Its value depends upon the ko threat situation. Bill: The throw-in at is a significant possibility. Black may gain by forcing the ko right away, instead of forcing White to throw in by making approach moves. This may be so even when Black loses the ko, because he can get more in exchange for it by forcing it early. Bill: If White has no ko threat, making the ko is a losing proposition. Through Black nets 8 points in his eye, plus whatever he gains for two tenuki to White's one. If White simply leaves this position alone, Black has only 7 points in his eye, and does not get an extra play elsewhere.